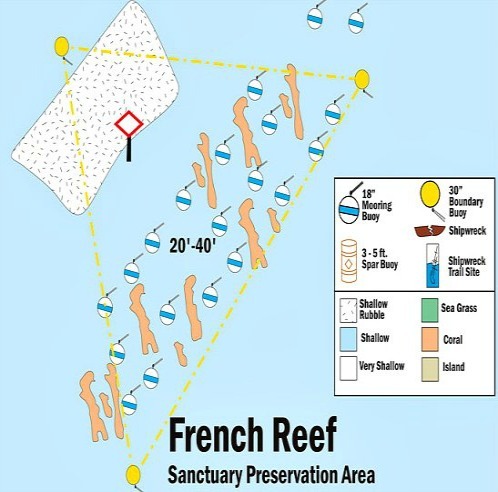 French Reef is part of the SPA area in the Key Largo Existing Management Area. This reef is popular for it's unusual structures which include numerous swim throughs, tunnels, caves, ledges and cliffs. All exciting dive features that are fun to explore on dive trips to this beautiful coral reef. The variation in structure also provides different habitats. This in turn promotes a broader spectrum of marine life as those that prefer to hide out are also accommodated. Some of the fish you'll encounter when exploring the caves and swim throughs never leave their lairs. This area is also less affected by current, however the plus side of that means there's also a negative. Visibility can be somewhat degraded at times due to the lack of current, but not so bad that anyone should consider not including this as one of their Key Largo diving sites. You'll also want to keep a lookout for larger grouper, moray eels and stingrays who've been known to frequent this area. French Reef is one of the more popular Key Largo diving sites, especially for those who've already been on an earlier dive trip to sites wrecks like the Benwood or the Spiegel Grove. This reef gives divers the chance to wind down, and explore some of the more unusual aspects the coral reefs in this area are famous for.